Spoilers abound in 2016 Topps Walking Dead In Memoriam. While similar to the Now format that has crossed over into sports and entertainment, In Memoriam is a bit more specific in its focus. The online-exclusive set honors the show's dead characters with a TWD tribute card. Featuring "fan favorite characters we have lost over the years," the 2016 Topps Walking Dead In Memoriam design is very simple with a large character image, name text box at the bottom, and little else. Available directly from Topps, the cards are sold individually for one week before they are retired. Only the amount ordered is printed and the final production numbers are announced following the end of the sales period. The on-demand cards join the growing options from Topps centered around The Walking Dead franchise. In addition to the TWD Card Trader digital app, collectors can also find more physical cards from the franchise, starting with Season 5 of the show. Use the tab above to see the ongoing checklist for the set. The list will be updated as new cards are announced. 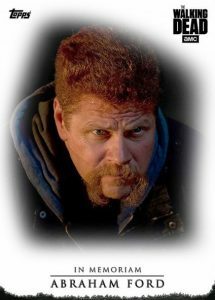 TOPPS THE WALKING DEAD ABRAHAM FORD IN MEMORIAM CARD ONLY 188 PRODUCED! Specific print runs will be added below when revealed. Shop for available In Memoriam cards on Topps.